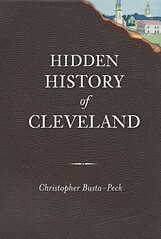 Cleveland Area History: Send Us Your Questions! Have you ever passed by an empty old building and wondered, "what was that used for? When did it close, and why?" Not sure what style your house is? Eager to know where the city's first residents are buried? Let us play History Detective for you. Email your burning question to clevelandareahistory [at] gmail [dot] com. We can't guarantee an answer to all of your questions, but we'll certainly give them a try. I will get to you with a question someday! I wanted to let you know that the 1918 house that was spray painted blue on our street is finally in the process of being repainted. It is being sanded and primed and painted nicely. We fought for this for several months on behalf of our neighbors and the community, and we won! Chelsea and Liam, that's so good to hear. Would you mind sharing the strategy that enabled you to achieve this, given that there didn't seem to be any zoning or other laws preventing it? I'm sure that others would love to learn how you did this.